The story of the Italian law for eradicating waste in the words of its advocate, the Honorable Maria Chiara Gadda. It all began with the laws which regulated the sector of food recovery for social solidarity purposes from the 1990s. These were created thanks to pressure from Third Sector operators who had started working with companies even before a law existed, and the result was Law 155 established in 2003, known as the law of the Good Samaritan. 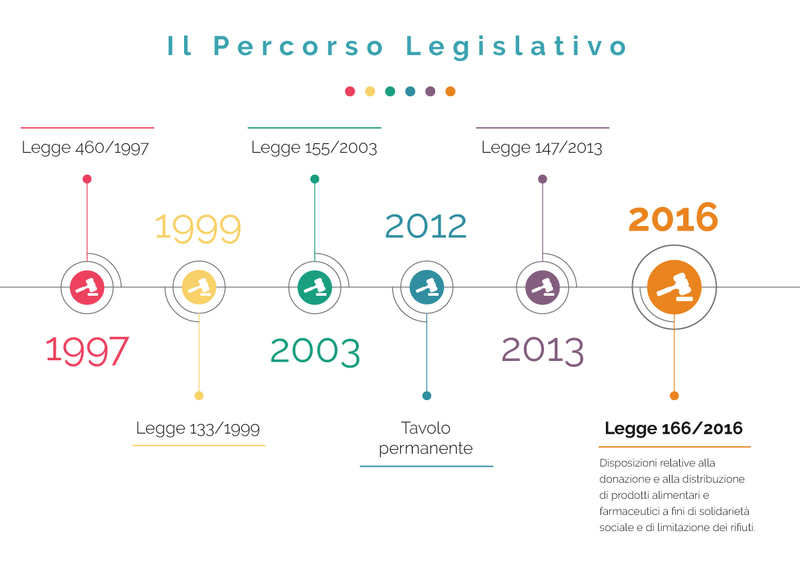 With this law the Italian Government established the end consumer on an equal footing to the volunteer organizations that collect and distribute food to the poor. It then assigned the organizations the task of ensuring food security, similarly to what occurs in the family context, without involving the production and/or processing phases of the food chain and limiting their competence to the preservation, transportation, storage and use of the foods. Now Law 166/2016 (also known as the Gadda law, named after the first signatory of, and spokesperson for, the Law in the Chamber of Deputies) extended the range of its stakeholders with a view to enabling all the parties involved to collect, store and distribute surplus resources, not only as in food products but also for pharmaceuticals, personal hygiene and cleaning products, office supplies and stationery and medication items, creating a hierarchy of donations that allowed items to be used for social solidarity purposes, especially if related to human consumption, or otherwise for animal consumption and in the worst case scenario, as compost. The hearings in the Chamber of Deputies not only involved parties from throughout the production and distribution chain and from the Third Sector but also from environmental and professional associations. As noted by one of the main parties of the Third Sector, Banco Alimentare, the Law "creates a legal framework in which the current laws on tax benefits (Laws 460/97 and 133/99), civil liability (Law 155/03) and health and safety procedures (Law 147/13) are included". “One of the most important points, for the purposes of quantifying the phenomenon and especially for providing clear indications about the kinds of goods which can be recovered, is the definition of the terms waste and surplus. Waste is refuse, while a surplus of something marks the launch of a virtuous pathway of recovery” the Honorable Maria Chiara Gadda stresses, and now this difference is very clear from Article 2. “Food surpluses” are: agro-food and agricultural food products which maintain their product hygiene and safety requisites but are, for example: unsold or unserved due to lack of demand, withdrawn from sale as they fail to meet the company’s sales standards; leftovers from promotional activities; nearing their expiry date; remainders from market testing initiatives for new products; unsold due to damage caused by the weather; unsold due to erroneous production scheduling; not suitable for sale due to alterations of the secondary packaging that do not compromise the storage conditions. Instead, “food waste” is the collective name for the food products discarded from the agro-food chain for commercial or aesthetic reasons, or because they are nearing their expiry date, and which are still edible and can potentially be destined for human or animal consumption and that, unless otherwise used, are destined to be disposed of. “The Law is based on the awareness that surpluses are generated throughout the production chain and representatives of all the parties involved were heard during the approval process, both formally in the hearings and also informally on all occasions where this was possible, through hundreds of meetings held nationwide” explains Gadda. Already in the first year in which it came into force, the data provided by the operators reported an average rise in donations of 21% (with higher absolute values in the central northern area, considering the more widespread distribution of Third Sector Organizations and companies there, but with a very significant percentage rise in the south. “The law also assigns value to the decisions of companies that freely choose not to put certain products on the market with the intention of donating them to the needy, making it possible to recover all the goods that lose their commercial value but are integral from a health and safety standpoint: we’re thinking about packs that cannot be sold individually, products that have exceeded the minimum storage time rather than foods not served at a wedding banquet or the restaurant of a cruise ship, as well as goods that have been seized but are suitable for consumption from a health and safety perspective. We need to work on the prevention aspect to reduce surplus food, but our challenge must be to increase the variety of the recovered products and multiply the number of donors, to meet the growing needs of people facing economic hardship” continues the advocate of the law. “In 2017, following a year of application, thanks to the ideas we received from the operators, we further extended the law, extending the range of goods that can be donated, simplifying the bureaucratic side and most of all extending the tax benefits to include donations in favor of all the third sector organizations registered in the National Unified Register which is being set up". The law has also had a positive educational effect, because it has encouraged all citizens to implement positive measures, such as making a more responsible purchase rather than good practices for using and storing foods. Law 166/2016 has drawn interest from many countries that still lack legislation regarding this issue. “The Italian recipe for eradicating waste and ensuring sustainable use of the resources has paved the way for many principles now the focus of the European Community, and this is something we can be proud of. Wasting our resources is futile, recovering them is in everyone’s interests” she concludes.